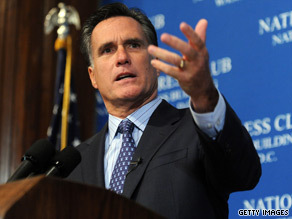 Mitt Romney on Monday warned members of the Tea Party movement not to mount third party efforts in general elections. Washington (CNN) - Mitt Romney has a message to Tea Party candidates nationwide: If you lose your Republican primary bids, stay on the sidelines. The former Massachusetts governor on Monday warned the grassroots movement not to mount third party efforts in general elections, which he said would siphon votes from Republican nominees. "If there is a conservative candidate that runs in the general election, then obviously, divide and fail is the result," Romney said in an interview with the conservative Web site Newsmax. "Hopefully Tea Party candidates will run in respective primaries and they will either win or lose. And if they win, they will go into the general. If they lose, they won't, and they will get behind the more conservative of the two finalists." Romney explained that "dividing our conservative effort in the general elections" would "basically hand the country to Barack Obama and Nancy Pelosi and Harry Reid, and that would be very sad indeed." Former Alaska Gov. Sarah Palin made similar remarks last month in a speech sponsored by the Arkansas Republican Party. "Now the smart thing will be for independents who are such a part of this Tea Party movement to, I guess, kind of start picking a party," she said, adding that the GOP would be the most natural fit for such activists. Romney had kind words for the Tea Party movement. "I'm really pleased that the silent majority is silent no longer," he said, predicting that the movement "will have have an impact on this election." "Not all the Tea Partiers are Republicans, not all of them vote for Republicans, but I think most of them will," he said. The potential presidential candidate also dismissed his second place finish to Texas Rep. Ron Paul in last month's Conservative Political Action Conference Straw Poll, which he chalked up to libertarian collusion. Paul's win broke Romney's three year winning streak in the straw poll. "The good thing about libertarians is that when they are called to show up somewhere they do, and when they get a call in the night saying, 'Hey, we need you to show up at CPAC or show up at a straw poll or show up at an event,' they will show up, and you've got to congratulate them for that," he said. "But I don't think there is a growing portion of Americans who are, if you will, Ron Paul devotees, but he has an influence, and we welcome his participation in the party. It's a big tent party." UPDATE: Paul spokesman Jesse Benton responded to Romney's claim. "It takes a tremendous amount of both support and organization to win a straw poll with the prestige of CPAC's," Benton told CNN in an e-mail. "We are proud that Dr. Paul has both. The message of liberty and sound money is growing everyday, and Dr. Paul is honored to be one of the leading spokesman." Come on, Romney – get a clue! Not everyone likes a party. It's the individual running that counts. So he's already counted their votes as Republican........but I thought they were this "independent" group???? I guess sooner or later they had to be told that they have been hi-jacked, and purchased by the RNC. I guess this will finally prove to these knuckleheads how stupid they are, and show how they've been played by the RNC. The Tea Party doesnt take to kindly to warnings from the likes of Romney. We will do as we sit fit on behalf of the PEOPLE! We should separate the Real Democrates from the Socialist that have invaded their party. Personally I'm a conservative and don't feel like true conservatisum is present in the republican party...... BUT at the same time socialist have invaded and took over the democratic party, that's where the real problem lies. Unfortunately the Dem's are not smart enough to recognize this and are right on board with the socialist agenda. They have definitely lost their way. Humm...you dont have it now anyway. Obama will will 2012...mark my words Conservatives! Here's what's sad, Mitt: Both parties are a depressing reminder of what politics in this country has become. Blame it on the Dems as much as you like, but both parties are entrenched, bought and paid for, without any interest in America's citizens. The Republicans are the same old party of regressive lunacy, bolster the rich, let capitalism run amok, greedy jerks. The Democrats are the same old party of social and corporate welfare. What have you done for us lately, again, Mitt? Bunning to be his running mate. Is it me, or is he still campaigning for the 2008 presidential election? Is he involve in anything else other than party politics and fundraising? There has got to be some community organizing he can get involve with so he can get to know the people rather than living inside of the Republican bubble. The the problem with our politics– no solutions, just people who spend their time getting elevated within the party. Get out and do something. Shouldn't the title of this story read "Romney to Ron Paul: For the love of god, please don't run third party"? Romney is terrified. Just wait till the SRLC straw poll results. If Paul wins THAT one too, stick a fork in the rest of the GOP. And if the GOP refuses to recognize that the same faction that got Barack Obama elected, college kids, are now increasingly behind Mr. Paul, who represents REAL fundamental changes, then the GOP will be dead in the water as well. It's time we brought common sense back to the Government. Ron Paul 2012! End the undeclared wars! Save the dollar!